Article 7; Every child has the right to a legal name and nationality, as well as the right to know and, as far as possible, to be cared for by their parents. A rights Respecting School teaches and models children's about their rights. It shows respect in all relationships between teachers, pupils, adults and the whole school community. As a Rights Respecting School, we base everything we do around the Rights of the Child. All plans and activities and day to day school life has the Rights of the child at its centre. The following video has been created by the RRS team, please watch and enjoy learning about how our school is a Rights Respecting School! At Portadown Integrated Nursery and Primary a very dedicated and enthusiastic team of pupils are the driving force of promoting the school's Rights Respecting ethos. work closely with everyone in the school in developing the Rights of all children. As a Rights Respecting School, the whole school community has a shared interest on what their roles and responsibilities are. Click on the links below to open up our Rights Respecting Charters. 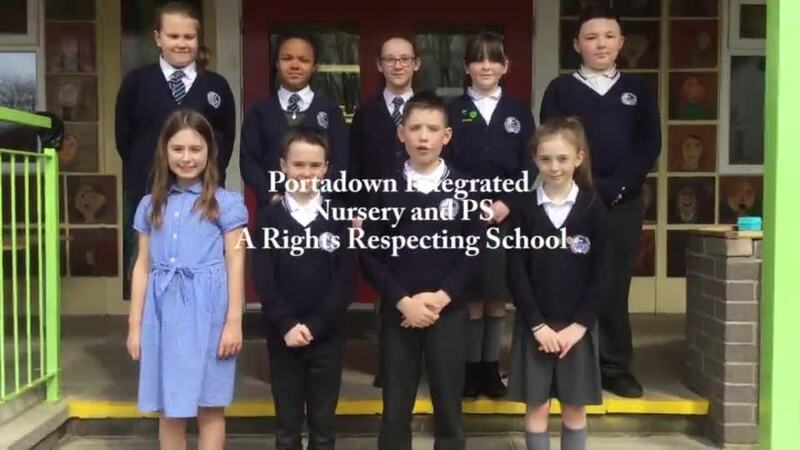 Portadown Integrated Primary School is putting the United Nations Convention on the Rights of the Child (CRC) at the heart of its school’s planning, policies, practice and ethos. A rights-respecting school not only teaches about children’s rights but also models rights and respect in all its relationships: between pupils and adults, between adults and between pupils. Class charts and displays in each classroom reflect these principles and promotes on every occasion the Rights of the Child.